This is my 200th post since starting this blog in July, and the final one for the month of May 2009. I plan to keep it up for as long as I have memories to recall, and something to say. I like to type. The subject today relates to the history of electronic music. I remember a time when it didn't exist at all in the public consciousness - except perhaps for special effects in SciFi movies from the 1950s. Then one day the analog synthesizer came along. It was a big deal at the time, but those piercing sounds, which at first were alien and strange, have since become the norm. Those mostly harsh and penetrating timbres are fully integrated into the vocabulary of today's commercial music business. One can safely venture to say that the majority of pop music distributed today is produced by electronic means of one kind or another. Currently, "digital" technology has replaced classic "analog" sound synthesis methods, but I think that for most listeners, analog and digitally produced sounds are cut from the same cloth. I worked a little in both mediums, but never had the patience, opportunity, or persistence to master the technique well enough to realize a significant electronic composition to my satisfaction. For example in 1980, I studied the MUSIC 11 language at MIT with professor Barry Vercoe, but found the chore of producing a complex piece while sitting at a VT100 dumb terminal even more laborious than the difficult process of music composition itself. Before that, I studied analog electronic music with Robert Ceely at NEC and Jim Michmerhuizen BSEM. That was way back in the Revox reel-to-reel tape recorder and razor blade tape-splicing days. Perhaps as personal computer technology continues to evolve, music software improves, and the cost of entry decreases, I will someday be able to think, formulate, create, and produce musical compositions entirely in this abstract medium with fluency and control. But for now, I'm happy to write notes in traditional notation for cellos and flutes (although I utilize Sibelius software from Avid). Acoustic instruments are an age-old technology that is is more or less stable, and (at least for now) does not require any extensive retraining on my part to write the simple and direct pieces that I am presently interested in composing. 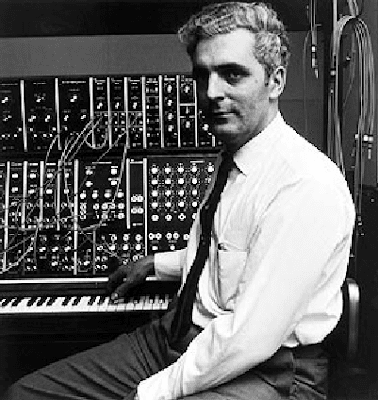 Robert Moog (1934-2005) was a new music icon. 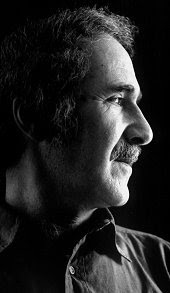 He embodied the spirit of the late 60s and 70s by inventing and promoting new electronic instruments that would fundamentally transform what music is made of and how it can sound. His synthesizers were utilized by a wide spectrum of musicians - from die-hard experimentalists in the avant garde, to rock musicians like Emerson, Lake, and Palmer (sounds like a Law Firm). One of the first synthesizer-only ensembles was Mother Mallad's Portable Masterpiece Company (now, that's a cool name for a group!). They were comprised of musicians David Borden (their founder), Steve Drews, and Linda Fisher and formed in Ithaca NY in 1969. I heard the ensemble perform for a live radio broadcast at the alternative WBAI in New York, and I still own their first album on Earthquack Records (released in 1973). But it was really Walter Carlos (now Wendy Carlos) who put Moog on the map with an album titled Switched on Bach. I was fortunate to have crossed paths with Dr. Moog a few times in the early 70s. I remember meeting him at Jim Michmerhuizen's Boston School of Electronic Music at an open house around 1973. Bob Moog was a very relaxed and congenial guy, and not prone to rapid-fire speech or self-promotion. He was very accessible, and generally interested in what other people were doing to apply his technology in the quest to make interesting works of music. He was equally interested in pop and avant garde forms of musical expression. On another occasion, he was introduced to me by electronic music composer Robert Ceely (who still owns a large Moog modular synthesizer, and has some of the first modules the inventor sold). I think that was at a Boston chapter of an Audio Engineering Society meeting at MIT. In those days composers aspired to be audio engineers, and recording studio engineers aspired to be composers. I've always had the impression that Moog would have preferred to be a musician himself, rather than the hard working Bronx-born electronics engineer he was destined to be. Yet inside of that brain, everyone could sense that the man was a quiet genius, and excited by life and the possibilities that electronic music could bring to it. It was fun to bring back all of these memories by viewing the 2004 Hans Fjellestad's documentary MOOG. The film falls a little short in capturing all of the controversy and energy in the music business of that era, since it was filmed recently. It's a little pensive and retrospective, ending with Dr. Moog, at the age of 71 (a year before his death from a brain tumor) performing "Old Man River" on this Theremin outdoors along a scenic river. He looked a bit like a Zen monk/Mad scientist. I assume that his impromptu performance was filmed in Asheville, North Carolina, where he moved to start Big Briar (his Theremin company) after selling the rights and interest in Moog Music to failed musical instrument manufacturer, Nolin Music. Hans Fjellestad, a musician and filmmaker from Los Angeles, is no stranger to the elect ronic music scene. He studied music composition with IRCAM-trained hi-tech improviser/composer George Lewis at University of California at San Diego. Fjellestad acquired his keyboard chops from classical pianist Krzysztof Brzuza. It is not surprising that there is a healthy respect for his subject in the documentary. He follows Moog around the world, to conventions, concerts, and captures him in candid conversation with his old engineering buddies, old hippies, Rock artists, and co-conspirators such as Herb Deutsch. This is the part of the film that interested me the most. For example, I had no idea the composer Vladimir Ussachevski (1911-1990) suggested to Moog and Deutsch that their synthesizer not be burdened with the cultural bias and technical limitations of a piano-like keyboard. In his view it should break with the past and avoid all of the the prior musical associations that a keyboard brings by implication. Of course, market forces prevailed, and the Moog Synthesizer was soon adopted by NY advertising executives as a way to promote the sale of beer - and I mean literally. Here is a famous high-energy 60 second TV ad where the Moog synthesizer was used to promote heavy drinking by the soon-to-be-history Schaefer beer company. Here is a clip about the Hans Fjellestad documentary.. 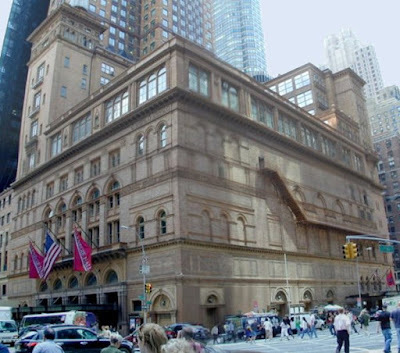 The Carnegie Hall Commissions project is without question impressive in scope. Now a broad sampling of twenty two new works that were commissioned and performed can be heard on the venue's website as streaming media. Accompanying each work is a photograph and short bio of the composer, along with a related link to find out more. Taken as a whole, this web resource is a good way to survey the zeitgeist of our musical culture, and attain a bird's eye view of what's being written today. While audiences have heard commissions specifically from Carnegie Hall since 1986 (with a piece by Leonard Bernstein), the commissioning process appears to be gaining momentum with no less than twelve new works performed in 2008 alone. Although familiar names can be found in the complete list (Carter, Babbitt, Reich), there are many new faces on the website and a wide-diversity of musical inclinations represented. I have to confess, that the under-thirty generation of composers is mostly new to me. I've never heard of them or their music, but clearly the public has. I have some catching up to do in order to stay on top the recent trends. But how does a poor struggling composer get to Carnegie Hall? Unfortunately the website does not provide a link to apply. Presumably it's a "don't call us, we'll call you" system. I would hope that being under-thirty and living in NYC is not a prerequisite. Then again, perhaps that's exactly what the public wants. 2) An acclaimed Italian conductor known for his volatile temperament, perfectionism, a fine musical ear, and remarkable photographic memory. I recently viewed the docu-drama by Larry Weinstein about his life. It's titled Toscanini in His Own Words (2008). The movie is based on 150 hours of recorded conversations that Toscanini shared with his friends and family. His son Walter secretly made these recordings in the final years of the conductor's life, and they became the source document for this interesting movie. It also includes a significant amount of historic footage related to the actual conductors' life. In the movie adaptation, Toscanini speaks of composer Alfredo Catalani, who he regards as one of the finest composers who ever lived - more important than Puccini, who according to Toscanini, was an egotistical hack. Ebben? ne andrò lontana aria from the opera La Wally by Alfredo Catalani seems to be an opera favorite. Toscanini named his second child, Wally, after Catalani's opera. but new information surfaces all the time. He was known to my family as Lui-Jean. The man sitting facing the camera with the French horn in the upper front left side of this historic photo really looks like it could be Louis. The photo of a recording session is dated from about 1925. 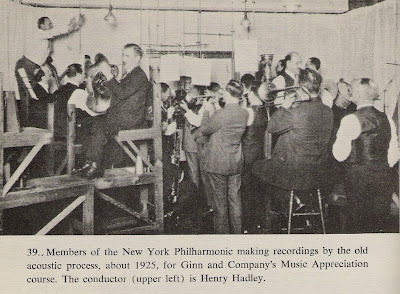 Here is a recording (Columbia A6070) made during one of the NY Philharmonic's first recording sessions in February of 1918. That would have been Louis' second year with the orchestra in the Principal horn seat. The French horns are featured in the Waltz of The Flowers from Tchaikovsky's Nutcracker - perhaps the first time the classic work was ever recorded. Arturo Toscanini, Wilhelm Furtwängler, Willem Mengelberg, Bruno Walter, Dimitri Mitropoulos, Sir John Barbirolli, Fritz Reiner, Leonard Bernstein, Wilhelm Steinberg, Pierre Monteux, George Szell, Eugene Ormandy, Leopold Stokowski, Charles Munch, Max Rudolf, Georg Solti, Rafael Kubelik, Ernest Ansermet, Thomas Schippers, Serge Koussevitzky, Jean Morel, Hans Rosbaud, Karl Böhm, Skitch Henderson (aka "Mitch Miller," known for his popular TV program "Sing Along with Mitch"), a 26 year-old wunderkind named Seiji Ozawa in 1961, Nadia Boulanger in 1962, and composer-conductors Igor Stravinsky, Lukas Foss, Paul Hindemith, Carlos Chavez, and Aaron Copland. He also performed under guest conductor Lorin Maazel who returned in recent years as the NY Philharmonic Music Director, although Maazel will retire at the end of the current season. Perhaps the most demanding and forward looking of these great conductors was Dimitri Mitropoulos. Mitropoulos was a champion of modern music, and put the NY Philharmonic on the map with world and American premieres of some seminal new works. One of his performances with the NY Philharmonic has been immortalized in a 1951 live recording at Carnegie Hall. It is of Alban Berg's opera "Wozzeck" and the orchestral song of "Erwartung" Op. 17 by Schoenberg. It was performed on April 12, 13th, and 15th, and recorded for Columbia Masterworks on LP. The recording has been digitally remastered and was recently reissued on Compact Disk (Sony MH2K 62759). 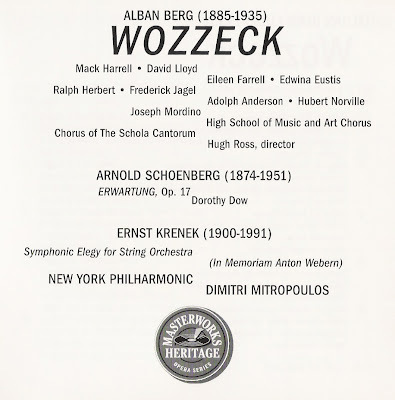 This particular recording of "Wozzeck" has been hailed by experts such as Milton Babbitt as the gold standard of performances. Echoing that sentiment, Tufts University composer and musicologist Mark DeVoto wrote in "The Metropolitan Opera Guide to Recorded Opera" (1993) "...this live concert recording remains, in its remarkable expressive and dramatic qualities, the standard against which all subsequent recordings must be measured." Knowing most of the commercial recordings of Berg's fist opera that have been released, I agree with this assessment. I'm also proud that my cousin Louis participated in such a historic performance by playing Assistant First Horn. I will listen to it with new ears. Here is an excerpt of the Berg recording from YouTube. It's the orchestral interlude of Act III (The Adagio at m320 on page 465 of the full orchestral score). You can clearly hear the four French horns of the NY Philharmonic play at 2'00" and 2'47" points in the video. In a previous post on this blog you can find an audio link to a performance by the NY Philharmonic of Mahler with cousin Louis playing Das Lied von der Erde conducted by Bruno Walter. Louis joined the NY Philharmonic just a few years after Gustav Mahler resigned as Music Director and died from his heart ailment. Louis would have also performed in the NY Philharmonic Mahler festival of 1959-60, which was led by Bernstein and Walter with the blessing of Alma Mahler and has been credited for launching the symphonies of Gustav into the foreground of public consciousness. Ever since then, Mahler has been an orchestral obsession and a mainstay of symphonic programming. To conclude our sampling of musical examples, here is a fine recording of Toscanini conducting the Overture to Rossini's Semiramide at Carnegie Hall in 1936 with the NY Philharmonic. At 37 seconds into the recording the French horns have a beautiful solo, and it is said on the web (by Abbedd) that Louis Ricci is playing First horn. You can hear my cousin Lui-Jean's pitch-perfect high notes in this recording. (Other wind prinicpals are: John Amans, flute; Bruno Labate, oboe; Simeon Bellison, clarinet; Benjamin Kohon, bassoon; Harry Glantz, trumpet; Mario Falcone, trombone). It is scored for four horns in "D" but Abbedd has a note that Louis is performing with a horn in "A." You can follow along with the music when the Andantino (section B) begins at 37 seconds into the recording. The first horn is playing the top line of the 4-voice texture. Below is a clip from the NY Times announcing Louis' retirement from the NY Philharmonic after 45 years of service. It's dated 5/18/1962. His last official concert would have been with Leonard Bernstein conducting at Carnegie Hall on May 20th, 1962. On the program were works by Stravinsky: "Fireworks" Opus 4, "Capriccio for Piano and Orchestra" (with Seymour Lipkin as the soloist) , and "Greeting Prelude." The Brahms Second Symphony in D Major ended the program. Not surprisingly, Louis is a celebrity in the town of Cervinara (near Naples, Italy) where he was born. 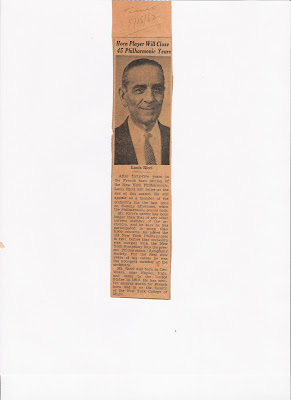 Below is a link to an web article by journalist Angelo Marchese summarizing his accomplishments. (scroll down to the bottom of the page). Louis' brother Mario (who was also born in Cervinara) was also an excellent French hornist. Mario was a member of the Metropolitan Opera Orchestra and lived in White Plains, NY with his wife Olga and children. There are many stories about Mario's visits with the family. Gunther Schuller, the American conductor, composer, and French hornist worked side-by-side with Mario in the orchestra pit for about 20 years. 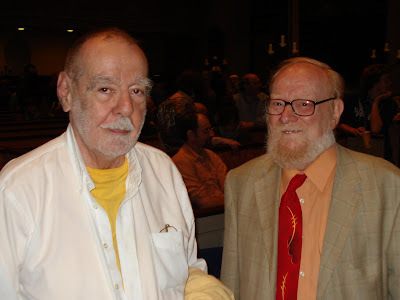 On Sunday May 17th, 2009 the sleepy bedroom community of Arlington Massachusetts held a big time tribute to one of its local heroes: composer Alan Hovhaness (1911-2000). Hovhaness ( Ալան Հովհանես in Armenian ) was born in neighboring Somerville, but grew up in Arlington and graduated from Arlington High School in 1929. He lived at 5 Blossom Street on "Turkey Hill" in a modest house that still stands today. As a child, the famous composer had attended the town's Cutter Elementary School and Junior High West (which is now the Ottoson Middle School). There are still those in the area who met the composer and know members of his family. Composer Pasquale Tassone - himself an Arlington High School grad and now-retired Director of Music and Fine Arts - met Hovhaness in 1974. At that time the high school presented a concert of the distinguished composers' work, and Tassone turned around from conducting the masters' music in rehearsal to find the famous composer watching on. "He was very soft spoken," remembers Tassone. To this day Arlington High School maintains in its archives historic photos, documents, and communications with the composer. Hovhaness repudiated his early works, destroying about a thousand scores in all. He was a recipient of Fulbright and Guggenheim Fellowships, attended the New England Conservatory, taught at Boston Conservatory (where avant gard jazz sax legend Sam Rivers was his student), and later joined the faculty of the Eastman School of Music. He was organist and choirmaster for St. James Apostolic Church of Watertown where he composed "sharagans" (hymns) for the church. Hovhaness is published by C. F. Peters, and I remember seeing many of his signed scores in the New England Conservatory library where he had generously donated copies (The Peters Edition website currently lists 321 works by Hovhaness in their catalogue). Hovhaness' career really got going when Leopold Stokowski premiered his Second Symphony with the Houston Symphony in 1955. Hovhaness moved to the Pacific Northwest in the 1960s, and quietly functioned as composer-in-residence with the Seattle Symphony for decades until his death in 2000. The appreciation of Hovhaness was elevated to a new level thanks to the hard work of a Commemorative Committee formed for this purpose. Dr. Elizabeth Gregory acted the Honorary Chair and nearly twenty board members and affiliate organizations participated. Funds were raised for the various events relating to the Arlington Hovhaness celebration. The initiator of the project and a member of the committee - Dr. Jack Johnston - was a neighbor of the young Hovhaness and knew the composer and his family personally. According to the Arlington Advocate, Dr. Johnson recounted this history at a small gathering at the former Hovhaness homestead with an outdoor performance by Boston University School of Music students. Turkey Hill residents looked on and listened in the yard, which was graciously made available by the current occupants of the house: the Spadafora family. 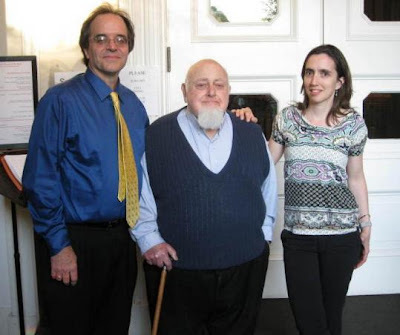 Martin Berkofsky, a concert pianist who would perform Hovahness later that afternoon, had chosen to celebrate the event by running a marathon from Mount Monadnock in New Hampshire to the former Hovhaness house in Arlington. 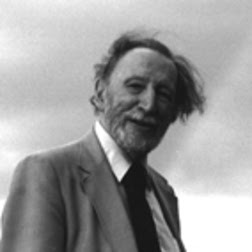 The run was to commemorate Hovhaness' life and his devotion to mountains (a recurring theme in his music). Later that afternoon, using funds that had been previously raised by the committee, the Alan Hovhaness Memorial was dedicated in the center of town at the Whittemore Park on Mass Ave. Following the outdoor memorial dedication, the public was invited to Robbins Town Hall for a free concert. The concert featured young musicians from Arlington High School as well as professional musicians. Representing AHS were the Madrigal Singers directed by Cheryl J. Christo and accompanied by Irina Chelnokova. They performed a short selection of works, but really stood out on "Watchman, Tell Us of the Night" by Hovhaness. Later, the Arlington High School Honors String Orchestra conducted by Sabato D'Agostino played his "Armenian Rhapsody Number 3." The professional soloists included Hovhaness scholar and pianist Martin Berkofsky. Berkofsky had met the composer in 1971, and premiered his piano piece"Saturn" (Op. 243) at Carnegie Recital Hall in a concert dedicated entirely to music of the composer. Berkofsky chose to perform the second movement subtitled "Andante religioso" from the work "Dawn on the Mountain of Initiation" Opus 303 ("Sonata Ananda") by Hovhaness. It is a longish, but meditative piece that alternates between two themes. One theme draws upon a melodic hammered cymbalon effect (which he based on the sound of the Middle-eastern instrument known as the "kanoon"). The other contrasting theme is a sublime mystical chorale in 7/4 meter. His music has a tonal center, but is based on rich Eastern or "Occidental" scales that fill the room with vibrating harmonics and a distinctive shimmer of sound. Berkofsky expertly delivered the piece from a faded and worn manuscript copy of the score, and must have been coached by the composer himself on the details of the works' musical interpretation. Hovhaness composed a large number of Symphonies: officially 67, but new ones are still being discovered. The Andante con nobilita movement of one of his Symphonies - Number 11 Opus 186 - was recently transcribed for piano four-hands by the young Niccolo Athens. It was performed in this version by Martin Berkofsky and Ani Hovsepian. As with much of Hovhaness' work, one can really appreciate the technical craft of his work. The composer is able to spin a web of thick counterpoint and never looses clarity in the process. His music is often slow and meditative, but speaks with a refined clarity of expression that seems to flow naturally. Hovhaness is not a composer who struggled for notes and who's music exhibits the inner conflict of composing. He wrote prolifically and without self-consciousness or inhibition. The work "Perseus" (after the Constellation) by Lexington resident Hayg Boyadjian was performed by flutist Orlando Cela and cellist Cynthia Forbes. It is a work that was commissioned by and dedicated to the former principal flautist of the Boston Symphony Orchestra, Doriot Anthony Dwyer. The work draws inspiration from the stars, and Boyadjian is an amateur astronomer and has based a number of his works on celestial objects of one kind or another. To me the work progresses as a self-contained and internally-unified set of variations. It logically explores melodic and harmonic materials derived from the opening unison melody expressively performed by Cela and Forbes. One of the many intriguing and standout moments in the work is the use of an arpeggiated three-note signature chord, It presents itself in the the two instruments in various forms, but often involves some fancy finger-work for the cellist and lots of natural harmonics across the cello's four strings. Forbes executed these effects well. Concluding the concert was a new work by Pasquale Tassone. 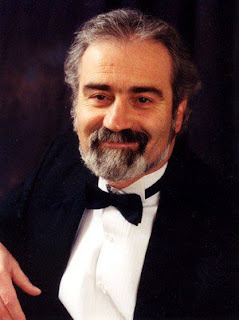 Tassone is a founder of the Lumen Contemporary Music Ensemble and now retired from his post as Director of Art and Music for the Arlington Public Schools. He composed "Dzon" (or Homage) specifically for this concert. His work draws upon, and borrows liberally from, ideas and musical devices that Hovhaness championed in his musical explorations. The work is sonically similar to Hovhaness, although Tassone interjects and reinterprets the classic Eastern scales, rhythms, and orchestral color to his own style. There are places where "Dzon" takes on the rhythmic vitality of a contemporary movie soundtrack, but the piece evolves nicely as a mini-concerto for marimba. The marimba soloist, Sylvie Zakarian, is amazing. She had to navigate a lot of notes with only four mallets. The music is demanding for the soloist, but beautifully written and expressive for the instrument. The marimba has both melodic and percussive roles in the multi-section work. The AHS Honors String Orchestra did well, and sounded harmonics with clarity in the senza misura section which functioned as a prelude to the entire work. Tassone borrowed this technique from Hovhaness, who may have been one of the first modern composers in the West to notate music without a prescribed rhythm or meter. After the concert, everyone came out on stage for a final bow and to acknowledge the standing ovation from the capacity audience at Arlington Robbins Town Hall. Everyone mingled and talked about the music over cookies and soda. A few local composers were present for the concert, including Betsy Schramm, John Kusiak, and myself. Hovhaness would have been pleased. While not the best of photos, here is a group shot of the first arrivals at Marty's retirement party last evening. From left to right: Armand, Jim, Michael, Allen (who drove up from North Carolina), Marty, and Eric. Soon the Boykan's house would fill up with his distinguished colleagues (past and present) and students (past and present) that he has known from 53 years of service on the faculty at Brandeis. At one point, I'm told that there were over 4o composers walking around the house. The food and drink was great, and Marty's wife Susan kept everyone well fed. Sunday night the Boston Microtonal Society (BMS) celebrated 20 years of history with a marathon concert of works a St. Paul's Cathedral on Tremont Street in Boston. The BMS has a mission to "showcase the enhanced expressive possibilities of composing and performing new music with new musical intervals." The BMS was founded in 1988-89 by composer and saxophonist Joseph Maneri at the New England Conservatory, where he taught a course on micro-intervals. (Ezra Sims had previously taught a micro-tone course at NEC too in the 1970s). With a generation or two of devoted students, it seems that microtonalists are attaining critical mass and momentum. Composing outside of the even-tempered scale - which many claim has all but destroyed music - seems to function as a new found garden for many. They may not all agree the quantity and the relative size of intervals to partition the octave up into, but leaving the rigidity of 12 evenly-spaced pitches behind is something they all can agree on. Modern music is often said to fall into camps: e.g. Electronic/Computer, Serial (or 12-tone), Aleatoric, Minimalism, New Romanticism, etc. Microtonalists have always been around in the mix, and it's a subculture that has a long history of musical exploration imbued with the rhetoric of contentious theoretical debate. I've always observed it from outside, not feeling the need to add more complexity into the already daunting task of writing with the standard number of pitches (Shirish Korde told me recently that he is working on a piece that utilizes just five pitches). As a religion of sorts, it appears that those who practice the microtonal way are converts from all walks of musical life. The 20th Anniversary concert for BMS demonstrated this large tent with a wide spectrum of composers. The hefty concert featured works by 11 composers of contrasting age, background, training, and geographic perspective. There were six world premieres on the program. Not surprisingly, the first half of the concert (before the intermission) lasted for an hour and a half. The commissioned works (all composed in 2009) were by New York-based Frank J. Oteri, John Mallia, James Bergin, Alain Bancquart, Caroline Park, and John Eaton. The Frank Oteri piece, Spurl for solo alto saxophone, opened the program. Aside from being a composer, Oteri is a noted online journalist for the web-based newsletter of the American Music Center: newmusicbox.org. Brian Ascawa, the sax soloist, announced to the audience that the composer did not mark many dynamics in his "minimalistic" piece. He asked the audience how we wanted the piece to end: loud or soft? A vote was taken, and the first round came to a dead tie. A retake election resulted in a narrow victory for the "loud" supporters. I was quite disappointed, since I have been a long term card carrying member of the of the Pianissimo Party. In any event, Spurl was probably not the best piece to start the program with. It was little more than a barrage of ascending scales and arpeggios with upper pitches that to my ear sounded more "out" than "in." "but also nowhere" by BMS artistic director Julia Werntz was based on five poems by E.E. Cummings. It featured two very fine singers: Jennifer Ashe (soprano) and Martin Near (countertenor). Werntz exploits the "quirky" sound of microtonal singing, and finds great musicality in the junction between timbre of the performers, the sounds that the human voice can make, and the text itself. It was a pleasure to hear. Her treatment of the visual elements of the text is ingenious. Manfred Stahnke's three movement "Viola Sonata in Just Intonation" (1991) was performed by Anne Black. Listening to the solo work, I had to wonder how this rather traditional piece is different from other performances of solo string music that I've heard. I don't think my ears are sharp enough to detect the subtle difference in intonation. It really sounded like any other solo viola piece to me. The classic avant-garde work on the program was "Vili-Samovili" (1999) by Bojidar Spassov from Bulgaria. He studied in Moscow at the Conservatory (instrumentation with E. Denissov), and selected a poem by Russian poet W. Chlebnikov "who had - in order to avoid serving in the army - fled into a psychiatric clinic." While in the psycho ward, Chlebnikov developed his creative methods and "crazy" style of writing. This fragmented text (which was sung in Russian) illuminates exchanges between a water nymph, a forest fairy, a fisherman, an old man, and the wind itself. NYC-based alto Christina Ascher really brought this piece to life, and at various times through the work accompanied her dynamic singing with the drone of two bowed water-bowls. As Spassov's piece picked up a frenetic momentum coming into the final stretch, Ascher simultaneously sang meandering micro-tonal lines over the drone while articulating the music with percussive mouth-clicks. It was greatly entertaining. John Mallia's new work "Dodo" for solo cello and electronics was yet another take on the microtonal sound world. Accompanied by "retro" sounding 1950s-era electronics, the cello part was written in a more pointalistic mode. The cello writing seemed to exploit atonality, dissonance, and angularity, which has not been a mainstream trend in the microtonal subculture of music. Cellist David Russell performed with great panache, but given the context of the concert I had trouble discerning the microtonal language. Perhaps the electronics (which were essentially non-pitched) injected too much complexity into the mix, and made it difficult to focus on the subtle differences in interval and tuning. I've always thought that electronic/computer music is a good option for microtonal composers, since pitch can be highly controllable and precise in its rendering of frequency. Overall, I didn't get the pitch-gestalt of this work, but the gestures, realization, and musical expression were right on. "Langmusick" by James Bergin was also a premiere. Bergin is Executive Director of BMS and Director of the select ensemble of top Boston musicians who were performing in the concert: NotaRiotous. His work was for solo trombone and performed with confidence and skill by New York-based trombonist and new music specialist Will Lang. The trombone is a very natural instrument for microtonal composers, and the rich possibilities it allows for melodic line is one of the attractive enticements that microtonal music has to offer. Bergin exploited some of the extended techniques that are possible on the instrument, including singing and playing at the same time to create beat-tones. Bergin has many years under his belt composing in the micro-world, and his inventiveness in melodic construction in particular seem to extend the possibilities of what can be done within the limitation of a single voice. His formative training in the fundamentals of music under the guidance of his teacher Joseph Maneri was based on the equally formative text books of Arnold Schoenberg. I think you can hear this influence in his music. Concluding the first half of the program was "If I Told Him" by Ezra Sims. Sims composed his piece in 1996 under a commission from Christina Ascher and Christoph von Erffa, who premiered the work at Darmstadt, Germany the following year. The piece has been performed frequently, and has been recorded for a soon to be releated CD on New World Records. The Sunday night performance was rendered by Ascher (alto) with Ted Mook (cello) who clearly perform the work as if they know it inside and out. The fine line between spoken-pitch and vocalized-pitch is what makes this piece so interesting to me. The complexity of vocal sound is formative. How everyday speech around us contains inflections of pitch (often microtonally organized) is what set Sims (a singer by training) on his compositional path. He "found" the appropriate pitches to accompany the text by Gertrude Stein (based on a recording of her own reading of fragments of her poems). Sims uses a system of 72-note to the octave, which modulates, shifts and changes tonal focus based on transposition and key center. It's a formative system, with sound theoretical justification that I can't go into here - even if I fully understood it. His music been microtonal since 1960. Beginning the second half of the concert we heard Jennifer Ashe and Will Lang together in a vocal/trombone duet by Joseph Maneri. This work, "Kohtlyn" was composed in 2000, and I remember it well from a performance given by the BMS years ago. It is based on text that composer invented - a made up imaginary language where sound plays king. This sound text comes from a book of poems that Maneri has been writing on the side. He constructs his music in 72-note equal temperament, but the performers do a lot of note bending, and one does hear plenty of the slide-whistle effect in Maneri's language as the performers articulate the score and express his written music. Composer Alain Bancquart (b. 1934) was commissioned to write a piece for this concert as well. His work "Duettino" was for English horn and cello. It utilizes quarter-tone, sixth-tones, and eighth-tones. By this time in the long concert my ear was growing fatigued, and I was beginning to have trouble concentrating on all of this new music. I confess that after four of five days my memory of this work is fading, and I really can't say anything meaningful about it. I do know that it was well executed by Elizabeth England on English horn and David Russell on cello. Study No. 2 (2009) by 23 year-old Caroline Park (recipient of the BMS Jonathan Keith Scholarship) was next on the program. The new work was written for - and performed by - soprano Lauren-Rose King. According to the composer's program note, the work was conceived as of a sort of "resonant sculpture." Park exploits the freedom of the human voice, which is devoid of all of the traps, customs, and technical baggage that traditional physical instruments carry with them. She appears liberated by the flexibility that voice provides, particularly in it's natural ability to sing any interval that one can mentally conceive. We should expect to hear more from this young composer, and it will be interesting to see where her compositions lead in the future. Mat Maneri, violist and son of composer Joseph Maneri, performed an impromptu improvisation. He wished his mother, and all mothers present at the concert, a happy Mother's day before he began his solo microtonal improv. It started off with Webern-like whispers, sul ponticello gasps, and the random pitter patter of a bouncing bow. Eventually, the improv took direction and gained speed. Yes, one can improvise in microtones. It's not impossible, but I have to wonder how accurate it all is, and what's the tonal organization behind it all. What holds it together besides gesture, timbre, articulation, rhythm, and form? Why does one note have to follow another? I'm not sure I can find an an answer to that question, as convincingly as Mat Maneri played. He (and we) certainly got into the "grove" of his improvisation, but does it rise to the level of musical experience that we all strive for in great works of art? Who knows. The commisioned work that concluded the program was "Some Reflections" (2009) by John Eaton (b. 1935). Like Ezra Sims (b. 1928) and Joseph Maneri (b. 1927), Eaton was once a 12-toner. Eaton studied at Princeton with the great serial masters. I find it interesting that all three of these established composers felt compelled to abandon not only the serial language, but the confining world of even-temperament to explore the wealth of microtones in their mature work. In fact, according to Matthew Guerrieri writing for the Boston Globe about this concert (published May 13, 2009), Eaton adapted the 72-note scale and highly refined pitch system of Ezra Sims for his new piece. Having heard a lot of Ezra's music, I have to say that the results are very different. Eaton approaches music very differently than Sims, and portrays a few vestiges of his volatile modernist past in his music. The opening of the piece unfolds with the extended possibilities of the flute (performed by Jessi Rosinski) by exploiting the harmonics and multiphonics of her instrument. The writing is intended to emphsize the "out-of-tune" nature of the over-tone series. The trombone (played by Will Lang) supplied beat-patterns and kept time - which a central idea of the poetic text (derived from fragments from the epic "Four Quartets" by T.S. Elliot). Jennifer Ashe and Martin Near sang with laser-sharp pitch clarity and commanding expression. The overall caliber of performance Sunday evening was very impressive. The group NotaRiotous was formed in 2006, and already is making a name for itself in the Boston area. James Bergin conducts where needed. They have a devoted audience that seems to transcend the limited nature of cultural "ghettos" that new music specialists tend to breed. Could it be that microtonal music is an all-encompassing form of musical expression rather than the cult-driven "ism" it has been so unfairly labeled? Only time will tell how mainstream this music becomes, but the BMS and their performing organization NotaRiotous seem to have made a lot of headway in their 20 years of music making. Pictured left to right: James Bergin, Joseph Maneri, and Julia Werntz (Photo by the Boston Globe). This installation presents selections from MoMA's collection that illustrate good design during the period from 1944 to 1956. It's on the 3rd floor in the Architecture and Design Galleries and contains milestone works by Charles and Ray Eames and Hans J. Wegner. This is an installation piece that "documents the intangible art of performance." The work is by Tehching Hsieh. Hsieh built this cage out of bamboo, and spent a entire year locked up inside. 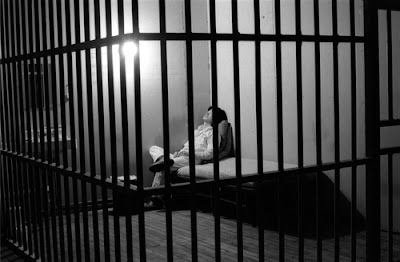 A black and white photograph was taken of him wearing his prison suit every day over the 365 days to record his progressive appearance. He began clean-shaven and and without hair and ended up with a large beard and full crop of hair. The photos are displayed serially in the MoMA media gallery on the 2nd floor. An affidavit from a lawyer is displayed that certifies that Hsieh remained locked in the cage for the entire time as well as the schedule of "visiting hours" in the original gallery for when the public was allowed to observe Hsieh in his cage. The work is titled "One Year Performance" and occurred over 12 months from 1978 to 1979. A discrete installation by Aernout Mik (Dutch, b. 1962). His work encompasses motion picture, sculpture, architecture, performance, and social commentary—interrogates the nature of reality and subverts the traditional relationship between viewer and viewed.